WOOSTER, Ohio – The Ohio State University’s Secrest Arboretum has many gardens, but its newest addition stands out for its therapeutic and research value. Dedicated in mid-September, the Lemmon and Rice Health and Wellness Garden was designed to boost visitors’ sense of well-being and to provide opportunities for research into the impact gardens and nature have on human health. Located on the Wooster campus of the Ohio Agricultural Research and Development Center, the 115-acre arboretum encompasses a variety of demonstration and research plantings that support the state’s horticulture industry and also provide spaces for community engagement and enjoyment. OARDC is the research arm of the university’s College of Food, Agricultural, and Environmental Sciences. Secrest Arboretum partnered with Ohio State’s College of Nursing to come up with a concept for the garden, make decisions about its design elements, and to conduct future research projects. There are nine pillars of wellness: emotional, social, physical, spiritual, career, financial, creative, environmental and intellectual. The garden focuses on six of them: environmental, physical, intellectual, emotional, spiritual and social. 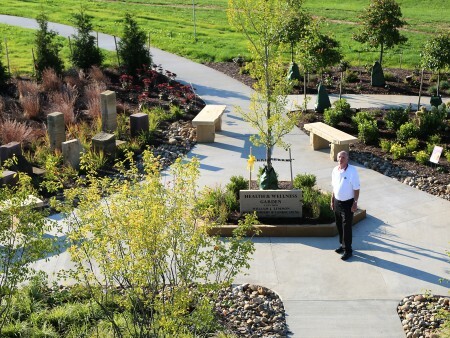 The garden was constructed thanks to donations from Bill Lemmon, president and owner of development company Lemmon & Lemmon Inc., and Kevin Rice, vice president of Rice’s Nursery and Landscaping — both located in the Canton, Ohio, area. Rice also designed the garden. Gardening 3-5 times a week has been found to be a good strategy to combat obesity and lower stress. Patients with chronic musculoskeletal pain taking part in horticultural therapy programs experience an improved ability to cope with chronic pain. Children with attention deficit disorder who play in grassy, outdoor spaces have less severe symptoms than those who play in windowless, indoor settings. Patients with clinical depression who participated in routine therapeutic gardening activities experienced a reduction of severity of depression and increased attentional capacity —benefits that lasted up to three months after the program ended. Dementia patients who have access to gardens are less likely to display aggression or suffer injuries, and they display improved sleep patterns, balanced hormones and decreased agitation. For Cochran, Secrest Arboretum is the perfect place to conduct new and innovative research into the benefits of garden and green spaces and further collaborations between Ohio State campuses and colleges, communities and other partners.